They weren't called athletic shoes or tennis shoes. Back then we called them sneakers. And while other kids had to suffer through the long humid sixties Indiana summers wearing lesser brands like Keds or P.F. Flyers, I was a Red Ball Jets man. My parents bought 'em at Wasson's department store at Eastgate Shopping Center in Indianapolis. I still remember sitting in that shoe department, fidgeting while the salesman sized me, wanting desperately to get the shoe thing over with so I could get to the real fun of the day. A corned beef sandwich at Sam's Subway Cafeteria-style Deli directly across the mall from Wasson's. To make matters worse, the Wasson's shoe department faced the deli. As you tried on shoes sitting next to Wasson's revolving entrance doors, you could see Sam's out the giant display windows. And you could smell the spiced aroma of Sam's deli meats drifting through those revolving doors with every entering Wasson's customer. Sam's was as close to heaven as this five year old could understand. As for H. P. Wasson's? It was Eastgate's north anchor department store. Eastgate was Indy's first malled shopping center. And it's original name was simply Eastgate Shopping Center. None of that "Square" this or "Mall" that back in 1957. We lost Wasson's in the late seventies. Eastgate lasted longer. 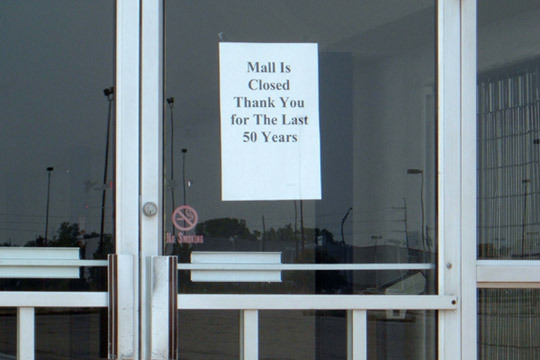 Until it finally gave up the shopping ghost - just before Labor Day 2004 and about thirty years longer than most people expected it to survive. Eastgate was built as an open-air shopping mall. Rain in spring. Humidity in summer. Wind in fall. Snow in winter. A flat concrete common area in the mall that hardly ever drained or dried. Waiting to see Santa in the open air of December was always good for a week-long Christmas cold. But if you shopped at Eastgate, you learned to put up with Indiana weather. Only after Edward J. DeBartolo built the nearby enclosed Washington Square in 1974, did Eastgate's owner decide to cover the mall. That became the first of many times the phrase "too little too late" was used to describe the happenings at Eastgate Shopping Center. Some people make the mistake of blaming Simon Property Group for Eastgate's failure, faulting two decades of Simon ownership. Simon bought Eastgate in 1981. The mall had already been struggling after the opening of Washington Square. By the late seventies, DeBartolo had snagged away Eastgate's south anchor stores, J.C. Penney and Sears Roebuck, and pretty much every other strong Eastgate tenant - clothiers like Hudson's and Levinson's - jewelers like Goodman's and Rost. Simon Property Group enjoyed some previous history with Eastgate. In 1957, Mel Simon worked as Eastgate's first leasing agent. He struck out on his own in 1959, and with his brothers built a few shopping centers, bought a few others, and by 1996 had merged with Washington Square owner DeBartolo. (The Simon's have also owned the NBA Indiana Pacers since 1983.) Yet by the time Mel Simon bought Eastgate, most of the tenants he had signed back in 1957 were gone. Simon tried to find a niche for the struggling Eastgate, renovating and renaming the center in 1982. As Eastgate Consumer Mall - sort of an early outlet mall concept - it signed Burlington Coat Factory to replace Wassons as the mall's north anchor. Chicago based Goldblatt stores had bought the Wasson's chain in the sixties, and eventually bled the chain dry - closing the chain by the late seventies. From 1957 on, Eastgate had two five and dimes - Woolworth and G. C. Murphy. The Murphy store facing Shadeland Avenue closed first. Woolworth facing Shortridge Road survived into the nineties. After closing, the Woolworth's soda fountain was bought and relocated to the Fountain Diner near downtown Indianapolis. As the larger Eastgate retailers like Murphy and Woolworth closed, their large floor space remained mostly unleased. Eastgate Consumer Mall struggled to replace the south anchors, the side-by-side J. C. Penney and Sears Roebuck stores. Both had left for opposite sides of Washington Square by 1982. The best Simon could find to fill their Eastgate retail space was a cut rate discount drug store. And while some might say that Simon's discount driven consumer mall concept was ahead of its time - by the time outlet malls came into vogue during the nineties, it was too late for Eastgate. The layout was dated and the structure was in poor repair. Eastgate's time as a mall had passed. A dated original design had store entrances to both the mall itself and to the surrounding parking lots. Most of those parking lot entrances were bricked over in the eighties. Ironically, the remaining open business in the Eastgate structure can now only be reached by one of those remaining original direct to the parking lot entrances. While many of Eastgate's early tenants had moved to Washington Square - most of those that remained eventually left business - stores like Morrison's women's clothing or the old Standard grocery store chain. Other chain stores like Hooks Drugs, Tuchman's Cleaners or Roselyn's Bakery closed - directing customers to nearby stand alone locations. Although Kittle's Furniture had opened a bargain brand furniture store in the old Standard space, most tenants under the consumer mall concept were small floor space mom-and-pop retailers. Hardly stores to rebuild a strong tenant base with. What was Eastgate's final death blow? A name associated with dead malls everywhere. North Carolina based Haywood Whichard. Whichard bought Eastgate from Simon in 2002 - leaving Eastgate to die. While Whichard owed the City of Indianapolis close to a half million dollars in back property taxes, he continued to look for a buyer. He didn't find one, and the City of Indianapolis scheduled Eastgate for an October 2004 tax sale. 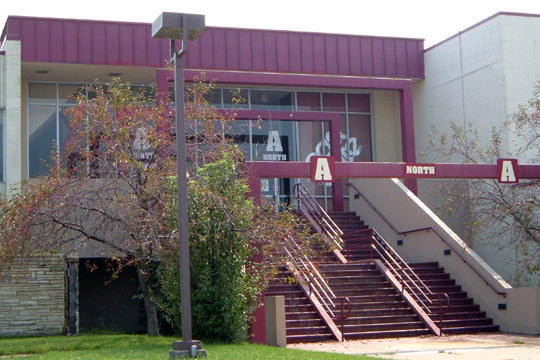 At that tax sale, Wachovia-Cust/Sass Muni V DTR bought the lien on the mall for $1.1 million. Since then, Eastgate has been sold again. On March 8th 2005, JTL Capital of Dallas, TX assumed ownership. The Director of Economic Development for the City of Indianapolis has since been quoted as saying "It is likely that the existing (Eastgate) building will come down." Although Dr. Larry Tavel, the mall's sole remaining tenant, sounds as if he intends to stay in place until his lease ends in 2006. 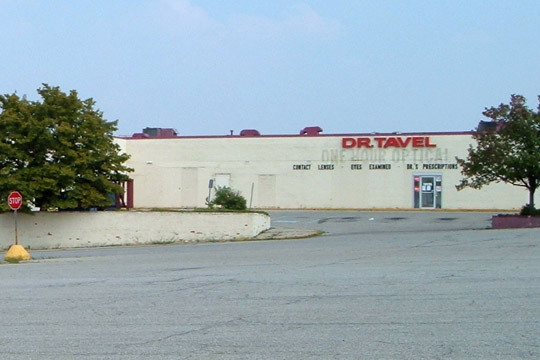 Tavel is an original 1957 Eastgate tenant. Eastgate's neighborhood is on the decline. Nearby factories have closed. Infrastructure has gone without repair or update. Housing prices have declined. And unlike Washington Square, Eastgate sits inside the east leg of Indy's I-465 bypass. It was inevitable that Eastgate's last name tenant - Burlington Coat Factory - would make a 2003 move to outside that 465 loop and join the others at Washington Square. 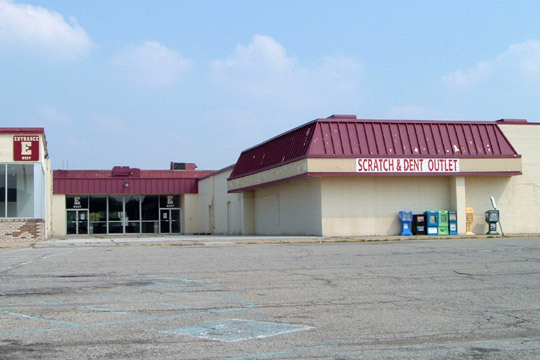 So what's next for the grounds of that fifties mall on the northeast corner of Washington Street and Shadeland Avenue? Rumors about car dealers and stores for big box retailers like Wal-Mart abound. Although Target just opened a store at Washington Square a few years back - and Wal-Mart has a new store just east of there. One of the strangest rumors was that of Eastgate being demolished for a new stadium for the NFL Indianapolis Colts. The problem with Eastgate is far bigger than the dead mall itself. The problem is with an area of Indianapolis on the decline. 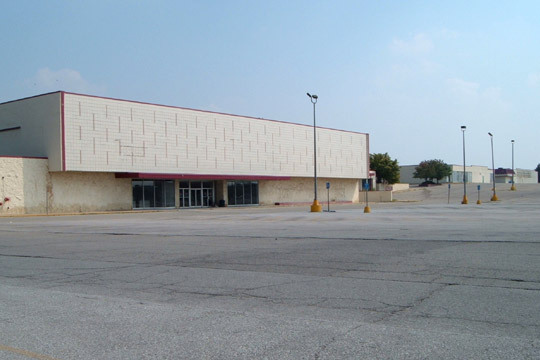 Indy's first two malls were the east side Eastgate and north side Glendale. Both malls took serious hits from newer larger DeBartolo built properties. Yet, with help from a strong neighborhood association and from the city of Indianapolis, the Glendale area continues to thrive. Without similar help on the east side, whatever replaces Eastgate is destined to find it a struggle not to fail. A view of the western length of the mall as it faces Shadeland Avenue. In the foreground left is the Wasson department store space on the mall's north end. At the far right of the picture is where the Standard Grocery used to be on the south end. This is the mall's south end as it faces Washington Street. To the left was the Standard grocery. To the right was J. C. Penney. This entrance faces Shadeland Avenue. The Scratch and Dent outlet used to be a First Indiana bank location. I seem to recall the empty space under the Entrance E sign was a coin operated laundry. To enter the mall from the north end, you had to climb these stairs. Fire code required the 1982 remodel to make the stairs wider. The originals were half the width of these. They were located between the north end of Wasson's department store and the Sam's Subway cafeteria. Most of us entered the Wasson store from the parking lot and rode the escalator to the mall level. The giant picture windows were the dining area for the Sam's Subway Cafeteria. By the late 70s, Sam's had closed and this had become one of Indy's seedier discos. The storefronts below hosted everything from dentists to insurance and travel agents. It appears as if the most recent use for the space was for a church. 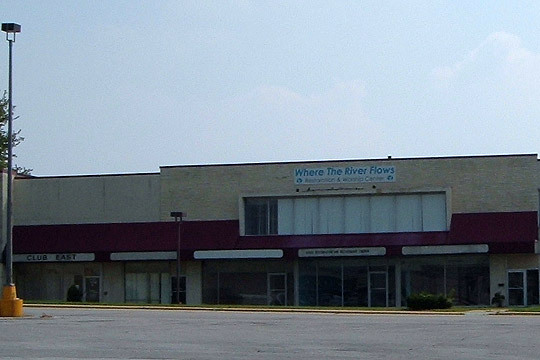 The sign reads "Where The River Flows - Restoration and Worship Center". These stairs led to a mall entrance just to the south of Wasson's. I seem to recall the tailor shop as being a shoe repair shop at one time. Look closely and you can see the locked gated fence blocking the stairway leading up to the mall level. 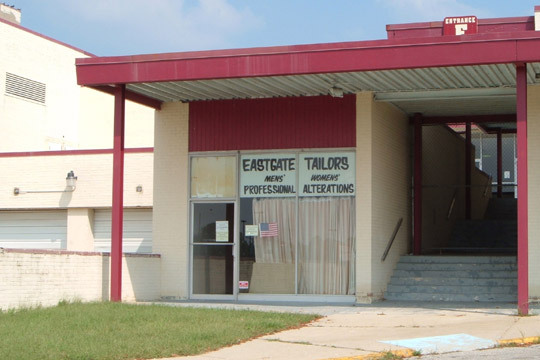 Positioned between the tailor shop and Scratch and Dent outlet entrances is Eastgate's last remaining tenant - Dr. Tavel. Notice the many bricked up outer entrance doors to long closed mall stores on either side of Tavel. 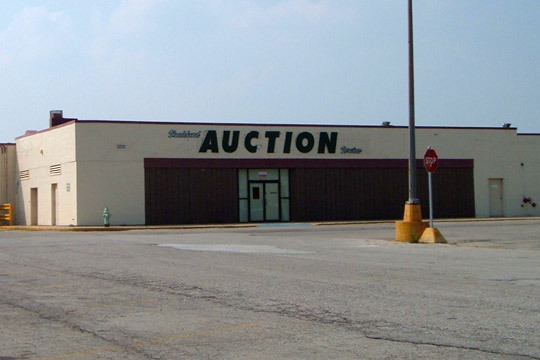 This auction house was the old Woolworth five and dime store on theeast facing Shortridge Road side of the mall. Finally a close up shot of one of the ink jet printed "closed" signs found at every mall entrance. This is at the south end of the mall - the entrance between the Standard and Penney stores. 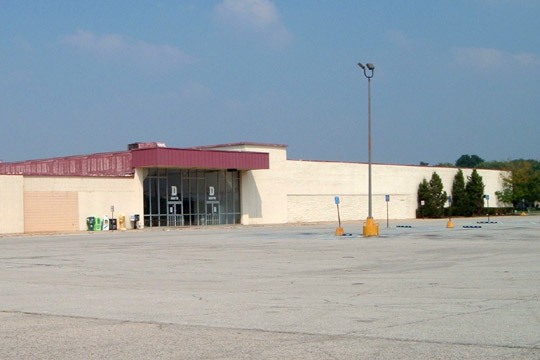 An out lot south of the mall structure on Washington Street features an empty Cub food store.